The biggest weekend on the Super League calendar takes place six weeks today, with the iconic Anfield stadium in Liverpool set to host the 2019 Dacia Magic Weekend on Saturday 25th – Sunday 26th May. 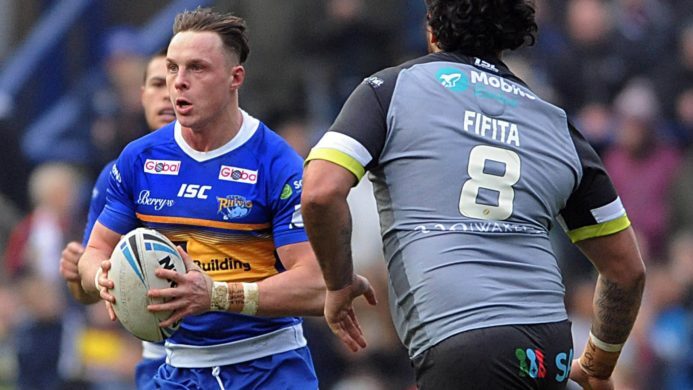 Leeds Rhinos take on London Broncos, who will play in their first Magic Weekend since 2013, on Sunday 26th May, kick off 3.30pm. Fans making the trip over to Merseyside can look forward to a fantastic festival of Rugby League on the May Bank Holiday Weekend. As well as watching the Rhinos in action, Sunday’s festival sees Salford Red Devils take on Hull KR, kick off 1pm, and St Helens battle it out against Castleford Tigers, kick off 6pm. Day tickets for Magic Weekend are brilliant value starting from £25 for adults, from £20 for concessions* and from £12.50 for juniors (16 & under). Weekend tickets are available starting from £40 for adults, from £30 for concessions* and from £20 for juniors. 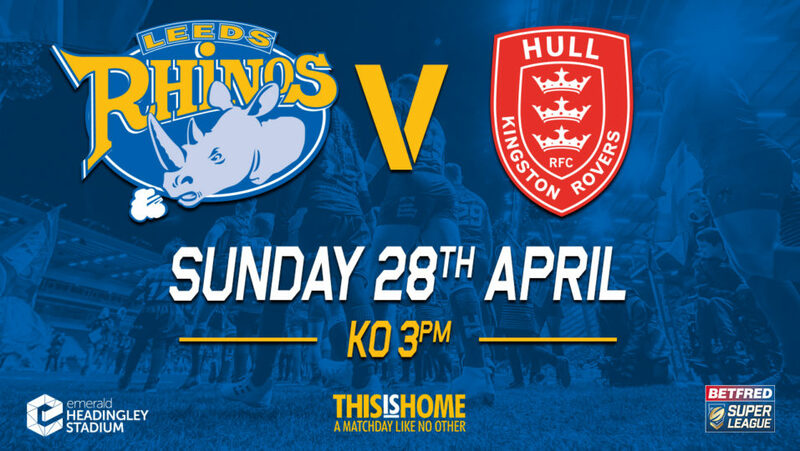 Rhinos Season & Supporter Members get an incredible 50% discount on their Magic Weekend ticket meaning day tickets are an absolute steal starting from just £6.25. If you’re not a Rhinos Member yet, Supporter Membership is priced just £15 so it’s well worth becoming a Rhinos Member to get instant access to the Magic Weekend ticket discount. The Members ticket discount is valid until midnight on Tuesday 30th April so make sure you book in advance to access the amazing 50% discount. 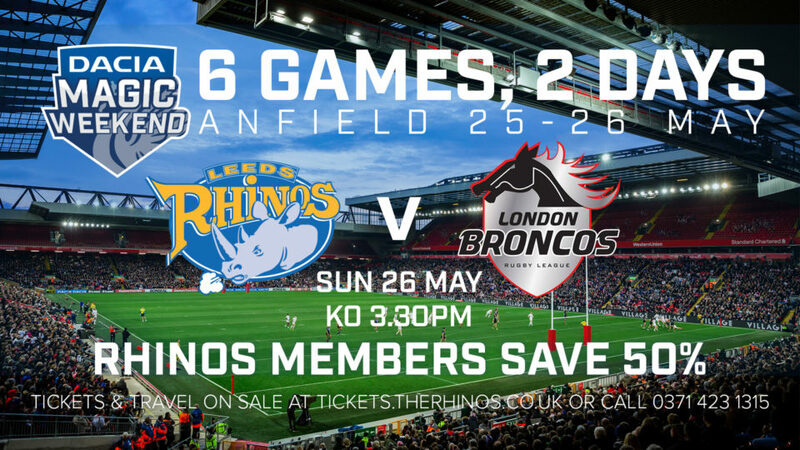 Take the hassle out of your journey to Liverpool and book return coach travel from the Rhinos. Same day return travel on the Sunday only is £20 per person, or if you’re heading over for both days to watch all 6 games return travel is £35 per person! Coaches will depart from Car Park F at Emerald Headingley at 10.30am on Saturday and 10am on Sunday. 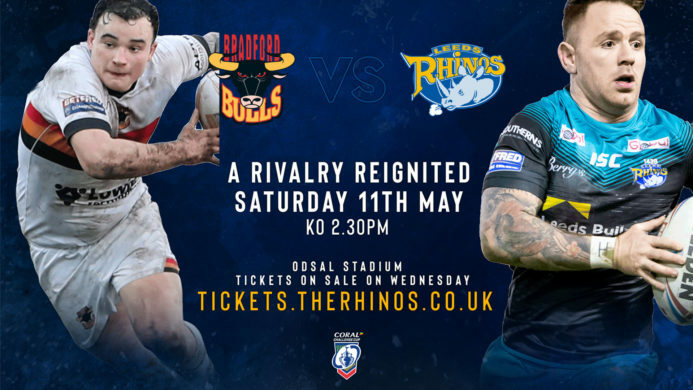 Book your tickets and travel online at tickets.therhinos.co.uk, call 0371 423 1315 or buy in person from the Ticket Office at Emerald Headingley Stadium.